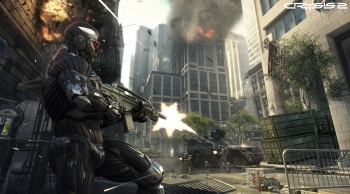 Crysis 2 is coming to consoles, but according to developer Crytek, it was not an easy fit. If you ask most gamers what they most remember about Crysis and chances are that the graphics will get mentioned pretty often. But those impressive graphics required equally impressive hardware, and as a result, Crysis was limited to a PC release. Crysis 2, on the other hand, is multi-platform, which has always been a goal of Crytek's, but has proved problematic. "That's what we always wanted to do. The big challenge during the development of CryENGINE3 has been scaling the engine whilst maintaining the visual quality and performance," said Crytek CEO Cevat Yerli. "This is always challenging; problems occurred of course, but we're really proud that our teams have managed to solve them as we proved in line with several engine presentations and will prove [this] with Crysis 2." Crysis 2 is set in New York, which will hopefully be a little less taxing on processors than the wide-open tropical islands of the first game, and should be released sometime this fall.